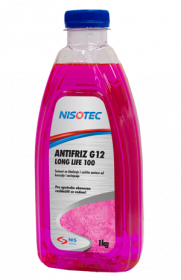 NISOTEC ANTIFREEZE LONG LIFE 100 (G12+) is a concentrated cooling fluid based on ethylene glycol, from the organic antifreeze group (OAT). It contains no nitrites, amines, phosphates, borates or silicates. It ensures protection of the cooling system from freezing and boiling and corrosion protection. It is especially recommended for filling the cooling aluminum system in modern engines with water cooling in cars and commercial vehicles of the world’s leading manufacturers: Mercedes, Volkswagen (G-12+), GM, and Scania, MAN etc. Before use, it must be diluted with water. It is suitable for open and closed cooling systems. Replacement period is up to 5 years. NISOTEC ANTIFREEZE LONG LIFE 40 (G12+) is a cooling fluid based on ethylene glycol from the group of organic ready-to-use antifreezes (OAT). It contains no nitrites, amines, phosphates, borates or silicates. It ensures protection of the cooling system from freezing and boiling and corrosion protection. It is especially recommended for filling the cooling systems of modern engines with water cooling in cars and commercial vehicles of the world’s leading manufacturers: Mercedes, Volkswagen (G-12+), GM, and Scania, MAN, etc., where the temperatures are high and is the most important protection of aluminum. It is suitable for open and closed cooling sisteme. Replacement period is up to 5 years. 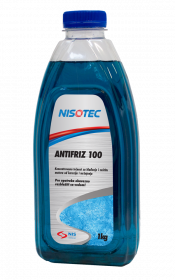 NISOTEC ANTIFREEZE EURO 100 (G11) is a concentrated cooling fluid to protect the cooling systems of motor vehicles: cars, trucks and buses, which require the application of hybrid antifreeze. It contains no nitrites, amines and phosphates, while the presence silicate provides excellent protection of water pump from cavitation. Before use, it must be diluted with water and, as such, it protects both conventional and aluminum coolers from frost, corrosion and overheating. Concentrations below 35% and over 70% are not recommended. Suitable for open and closed cooling systems. Replacement period is 3 years. NISOTEC ANTIFREEZE EURO 40 (G11) is the ready to use cooling fluid for the protection of cooling systems of motor vehicles: cars, trucks and buses, which require the application of hybrid antifreeze. It contains no nitrites, amines and phosphates, while the presence silicate provides excellent protection of water pump from cavitation. It protects both conventional and aluminum coolers from frost, corrosion and overheating. It is suitable for open and closed cooling systems. Replacement period is 3 years. NISOTEC ANTIFREEZE 100 is a concetrated cooling fluid for the protection of cooling system of the engine, based on monoethylene glycol and corrosion inhibitors. It contains no nitrites, amines or phosphates. Before use, it must be diluted with water. Efficient protection from freezing and/ or overheating is obtained by fluids containing 30 to 50% concentrate in water. Concentrations below 35% and over 70% are not recommended. It provides good protection against freezing, corrosion and overheating of the cooling system. It is suitable for open and closed cooling systems. Replacement period is 2 years. 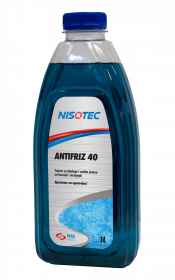 NISOTEC ANTIFREEZE 40 is the ready to use coolant fluid for the protection of cooling systems of motor vehicles, based on monoethylene glycol and corrosion inhibitors. It contains no nitrites, amines or phosphates. It provides good protection against freezing, corrosion and overheating of conventional cooling systems. It is suitable for open and closed cooling systems. Replacement period is 2 years. Ethylene glycol and corrosion inhibitor based coolant and engine protection liquid. It contains no nitrites, amines, phosphates or borates. Antifreeze is designed for engine and entire cooling system protection against freezing, overheating, rust, corrosion and cavitation. It protects all types of cooling system construction materials. The liquid is ready for use, and is to be poured directly into the engine refrigerator thus providing secure protection against freezing down to -38°C. Change period is two years. Concentrated coolant and engine protection liquid based on ethylene glycol and the latest generation of “OAT technology” based corrosion inhibitors. It contains no nitrites, amines, phosphates, borates or silicates. It is especially recommended for protection of aluminum coolers of modern vehicles. It provides long change intervals of up to 5 years. 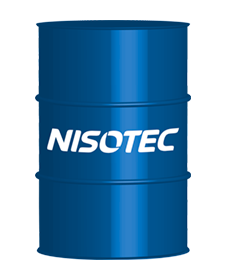 Before use, the product must be diluted with NISOTEC DEMI water following the mixing table.